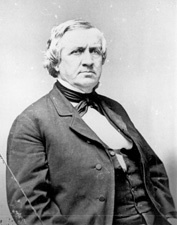 HALE, John Parker, a Representative and a Senator from New Hampshire; born in Rochester, Strafford County, N.H., March 31, 1806; received preparatory education at Phillips Exeter Academy, Exeter, N.H.; graduated from Bowdoin College, Brunswick, Maine, in 1827; studied law; admitted to the bar in 1830 and commenced practice in Dover, N.H.; member, State house of representatives 1832; appointed by President Andrew Jackson as United States attorney in 1834, and was removed by President John Tyler in 1841; elected as a Democrat to the Twenty-eighth Congress (March 4, 1843-March 3, 1845); refused to vote for the annexation of Texas, although instructed to do so by the State legislature, which then revoked his renomination; elected as a Free Soil candidate to the United States Senate in 1846 and served from March 4, 1847, to March 3, 1853; unsuccessful candidate for President of the United States on the Free Soil ticket in 1852; again elected to the Senate in 1855 to fill the vacancy caused by the death of Charles G. Atherton; reelected in 1859 and served from July 30, 1855, to March 3, 1865; chairman, Republican Conference (Thirty-sixth Congress); chairman, Committee on Naval Affairs (Thirty-seventh and Thirty-eighth Congresses), Committee on the District of Columbia (Thirty-eighth Congress); appointed Minister to Spain 1865-1869; returned to Dover, N.H., and died there November 19, 1873; interment in Pine Hill Cemetery. American National Biography; Dictionary of American Biography; Lowden, Lucy. Black as Ink - Bitter as Hell: John P. Hales Mutiny in New Hampshire. Historical New Hampshire 27 (Spring 1972): 27-50; Sewell, Richard H. John P. Hale and the Politics of Abolition. Cambridge: Harvard University Press, 1965.